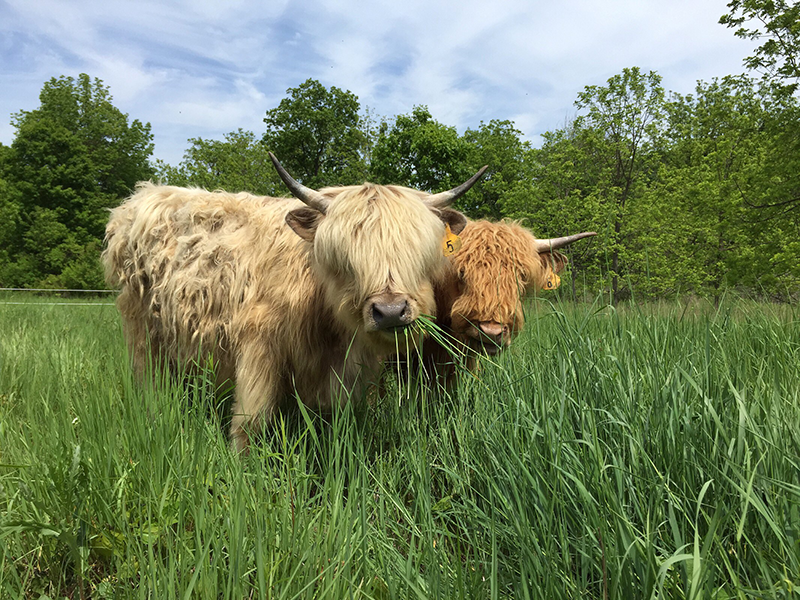 Our Highland cattle descend from the native cattle of the Highland Region in Scotland. This Heritage breed thrives on rough forage and in cold, wet climates and is celebrated for the excellence of its beef. On our farm, they roam freely on the pastures and enjoy a forage-based diet. 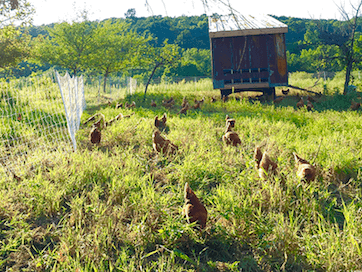 We raise a mix of Heritage broiler chicken breeds on pasture, where they can range freely and forage on fresh grasses, legumes, seeds, and insects. We supplement their diet with fresh feed that we custom grind using 100% non-GMO local grains and organic minerals. The hogs we raise are Heritage breeds, including Large Blacks, Ossabaws, Tamworth, and Berkshires. These hogs are well suited to live on pasture and woodland terrain. 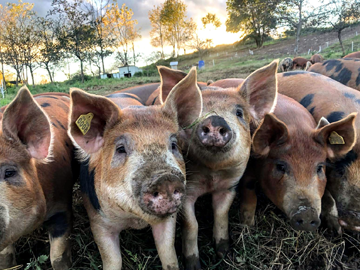 Besides all the good stuff they get while foraging, their diet is supplemented with fresh feed that we make on our farm using 100% non-GMO grains and organic minerals. The quality of the pork they produce is exceptional. 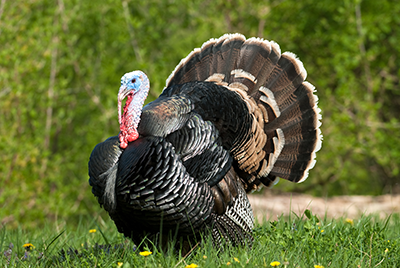 We raise all-natural turkeys on pasture. We get our two-day-old chicks in early May and raise them up until the weekend before Thanksgiving. This allows us to offer fresh (never frozen) turkeys to our customers the few days before the holiday. We save some of our turkeys for Christmas as well. On pasture, the turkeys can eat fresh grasses, legumes, seeds, and insects. To supplement what they eat in the fields, we make fresh feed from 100% non-GMO, locally grown grains and organic minerals. 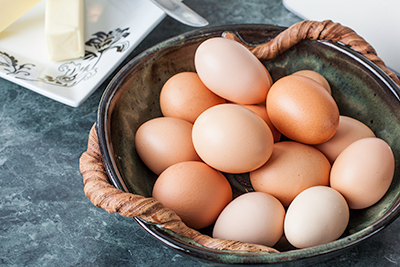 Our laying hens follow our cattle on pasture, cleaning up after them and foraging freely on grasses, legumes, seeds, and insects. They also help out in the orchard and gardens by fertilizing the fruit trees and vegetable fields. Our fresh, 100% non-GMO feed is added to their diet. The hives up in our orchard provide us with plenty of honey. 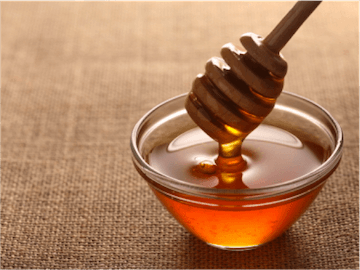 Not only do we get delicious honey from our bees, they are essential pollinators for all of our fruit trees and vegetables. Our hives are maintained by John from Top of the Mountain Honey Bee Farm, located right over the mountain in Wantage. 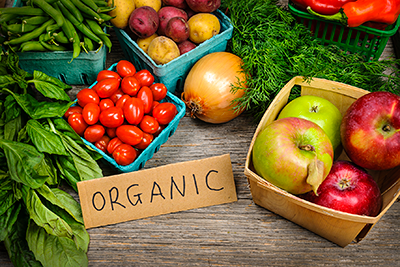 We are excited to announce that we growing over 75 different varieties of certified organic fruits and vegetables this season. All of our produce is grown here at the farm and will be available in our market this spring, summer, and fall. Stop by our market or join our mailing list to see whats available.